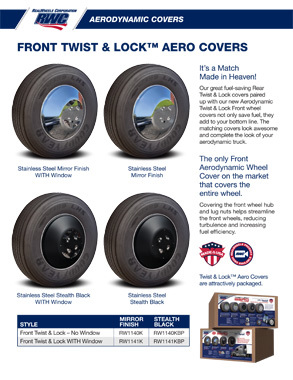 SIMULATORS FRONT AERO COVERS • The only Front Aerodynamic Wheel Cover on the market that covers the entire wheel. • Covering the front wheel hub and lug nuts helps streamline the front wheels, reducing turbulence and increasing fuel efficiency. 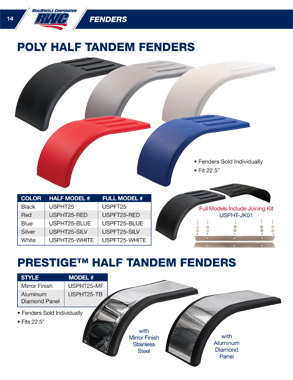 • With our Front Aero Covers you’ll save even more! Stainless Steel Mirror Finish S.S. Mirror Finish WITH Window STYLE MODEL # Stainless Steel Mirror Finish RW1129K S.S. Mirror Finish w/ Window RW1138SK 16” TO 24.5” STAINLESS STEEL SIMULATORS Stainless Steel Simulators offer a front profile and deep rear inset that simulates the look of aluminum wheels. 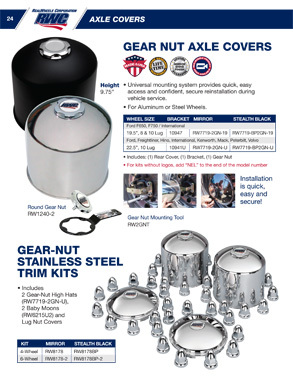 • High-quality, non-magnetic 304L stainless steel—will not rust, pit, corrode or turn yellow. 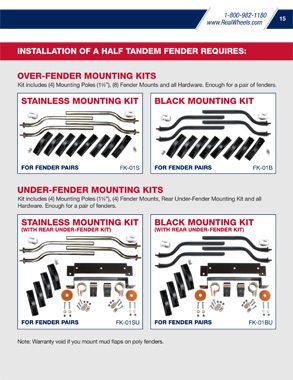 • The hook mount systems do not require excess stud. • These systems do not disturb the torque of the lug nuts. 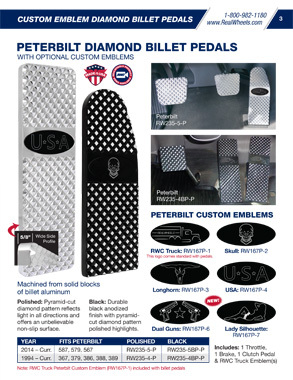 BILLET PEDALS PETERBILT BILLET PEDALS Peterbilt Peterbilt 587, 579, 567 587, 579, 567 Peterbilt Peterbilt 379, 386, 388, 389 379, 386, 388, 389 Raised Diamond Flat Diamond Black Diamond YEAR FITS PETERBILT STYLE MODEL # 2014 – Curr. 587, 579, 567 Raised Diamond Cut RW235-3-Pete 2014 – Curr. 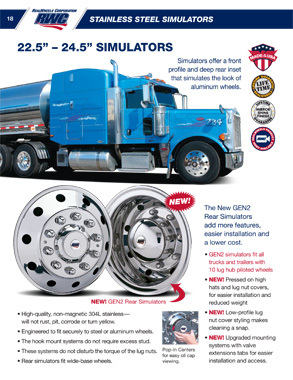 587, 579, 567 Flat Diamond Cut RW235-3FD-Pete 2014 – Curr. 587, 579, 567 Black Diamond Cut RW235-3BP-Pete 2001 – Curr. 379, 386, 388, 389 Raised Diamond Cut RW235-1-Pete 2001 – Curr. 379, 386, 388, 389 Flat Diamond Cut RW235-1FD-Pete 2001 – Curr. 379, 386, 388, 389 Black Diamond Cut RW235-1BP-Pete 1994 – 2000 379, 386, 388, 389 Raised Diamond Cut RW235-2-Pete 1994 – 2000 379, 386, 388, 389 Flat Diamond Cut RW235-2FD-Pete 1994 – 2000 379, 386, 388, 389 Black Diamond Cut RW235-2BP-Pete • Machined from solid blocks of billet aluminum • Includes: 1 Clutch, 1 Brake and 1 Gas Pedal • Installs easily • Polished: Pyramid-cut diamond pattern reflects light in all directions and offers an unbelievable non-slip surface. • Black: Durable black anodized finish with pyramid-cut diamond pattern polished highlights. 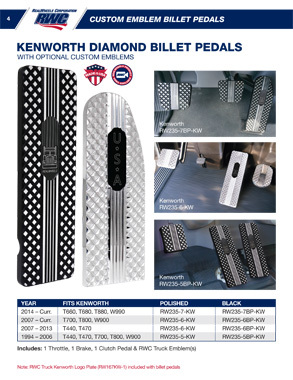 BILLET PEDALS KENWORTH BILLET PEDALS Kenworth 2014 – 2016 Kenworth 2007 – 2013 Kenworth 1994 – 2006 • Machined from solid blocks of billet aluminum • Includes: 1 Clutch, 1 Brake and 1 Gas Pedal • Installs easily • Polished: Pyramid-cut diamond pattern reflects light in all directions and offers an unbelievable non-slip surface. • Black: Durable black anodized finish with pyramid-cut diamond pattern polished highlights. 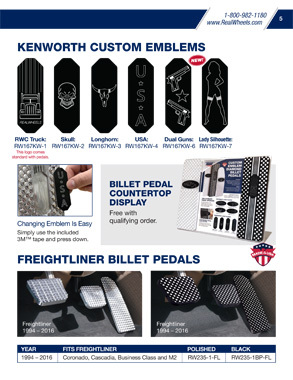 Billet Pedal Steps Countertop Display Free with qualifying order. 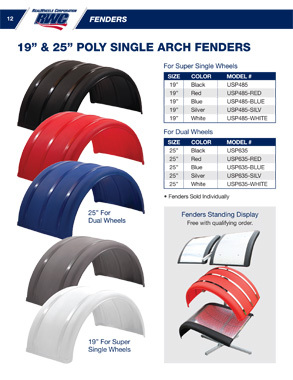 FENDERS 19” & 25” POLY SINGLE ARCH FENDERS For Super Single Wheels SIZE COLOR MODEL # 19” Black USP485 19” Red USP485-RED 19” Blue USP485-BLUE 19” Silver USP485-SILV 19” White USP485-WHITE For Dual Wheels SIZE COLOR MODEL # 25” Black USP635 25” Red USP635-RED 25” Blue USP635-BLUE 25” Silver USP635-SILV 25” White USP635-WHITE • Use with FK-02 or FK-03 Mounting Poles and Mounting Brackets (Sold Separately) • Fenders Sold Individually Fenders Standing Display Free with qualifying order. 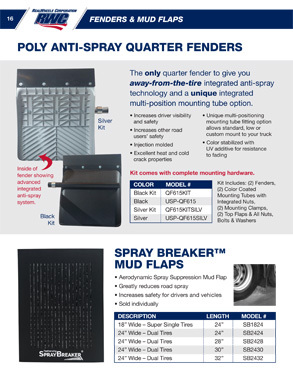 ACCESSORIES SPRAY BREAKER™ MUD FLAPS • Aerodynamic Spray Suppression Mud Flap • Greatly reduces road spray • Increases safety for drivers and vehicles • Sold individually SIZE MODEL # 18” Super Single Tires SB1824 24” Dual Tires SB2424 FENDERETTES • Rolled from high quality 14 gauge 304 stainless steel, then polished and buffed to a mirror-shine finish. • Three stock profiles. Custom profiles available. • Radius ranges from 17.5” up to 29”. 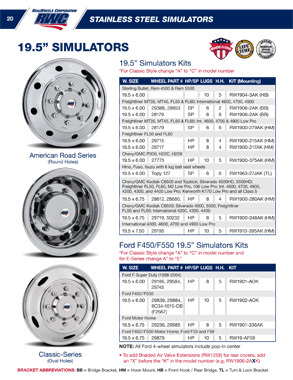 Designed to fit around tire sizes of 16” thru 17.5”, 19.5”, and 22.5” thru 24.5”. 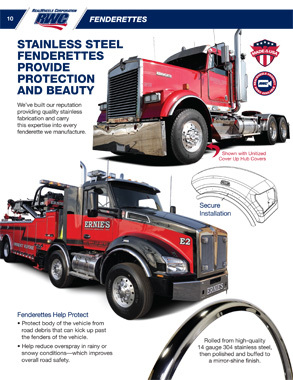 • Length, radius and hole placement to your specifications. Contact us for a free estimate. 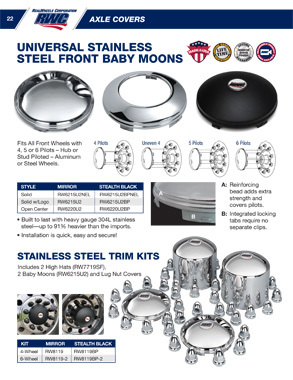 AXLE COVERS UNIVERSAL STAINLESS STEEL FRONT BABY MOONS Fits All Front Wheels with 4, 5 or 6 Pilots – Hub or Stud Piloted – Aluminum or Steel Wheels. 4 Pilots Uneven 4 5 Pilots 6 Pilots Continuous STYLE MODEL # Solid RW6215U2NEL Open Center RW6220U2 • Built to last with heavy gauge 304L stainless steel—up to 91% heavier than the imports. • Installation is quick, easy and secure! A: Reinforcing bead adds extra strength and covers pilots. B: Integrated locking tabs require no separate clips. 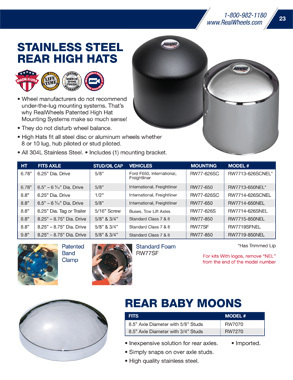 REAR BABY MOONS FITS MODEL # 8.5” Axle Diameter with 5/8” Studs RW7070 8.5” Axle Diameter with 3/4” Studs RW7270 • Inexpensive solution for rear axles. 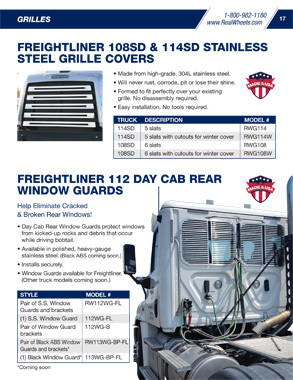 • High quality stainless steel. • Simply snaps on over axle studs. • Imported. 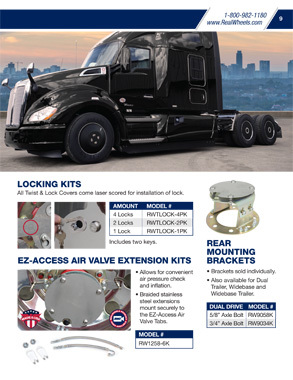 EZ-ACCESS AIR VALVE EXTENSION KIT • No need to remove axle nuts— provided jam nuts secure onto excess thread. 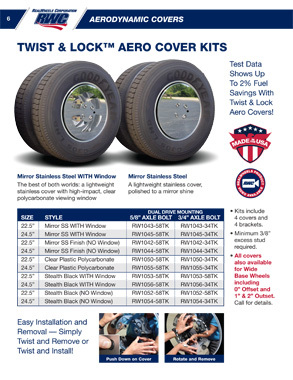 • Allows for convenient air pressure check and inflation. 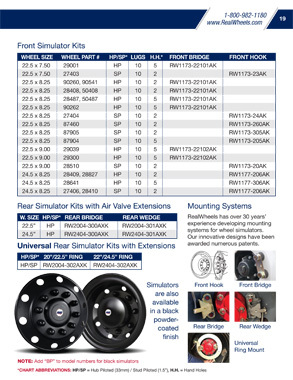 • Universal design for 5/8” and 3/4” axle studs. • Braided stainless steel extensions mount securely to the EZ-Access Air Valve Tabs. 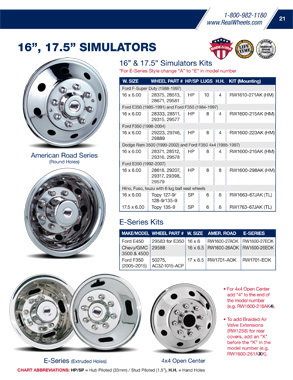 EZ-Access Kit RW1258-5K EZ-Access Kit for Twist & Lock Aero Covers RW1258-6K VALVE STEM STABILIZERS • These Valve Stem Stabilizers help prevent damage to extensions caused by the rubbing of the extension against the wheel. 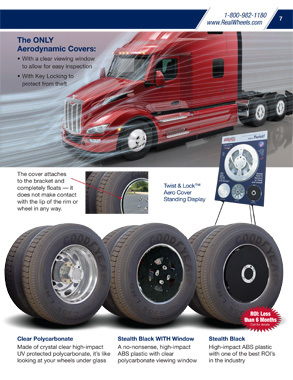 A worn extension may lead to air leakage and result in tire damage. 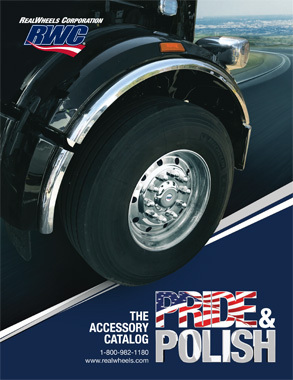 • Easy Installation—Simply align the rubber stabilizer with the valve extension and push into the wheel hole. 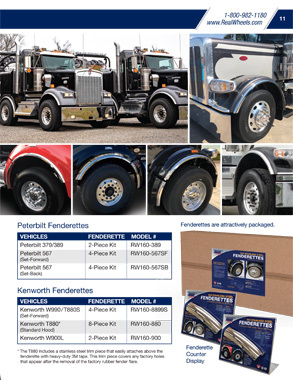 SIZE WHEEL MODEL # 2” Round Aluminum RW0020VSB-2 2.5” Round Aluminum RW0025VSB-2 2.8” Round Aluminum RW0028VSB-2 3” x 4.5” Oval Steel RW0030VSB-2 Aluminum Wheels Steel Wheels Sold in pairs. POP PACKAGING We’ve designed these attractive and functional clamshell packaging, boxes and header cards to help you sell more product. 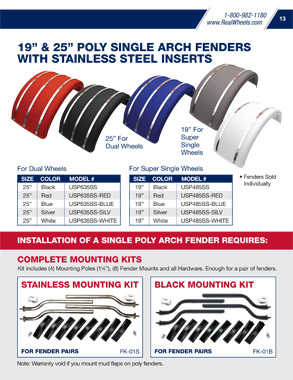 Contact a RealWheels Product Specialist to learn more and to place your stocking order. TRUCKER’S BOTTLE OPENERS Crack open a cold one with ease with these truck-themed bottle openers. • Precision laser-cut from heavy-gauge 304 brushed stainless steel. • They won’t rust or pit. • Magnet on back for storage & display. Packaged for easy POP Display. Custom engraving available. 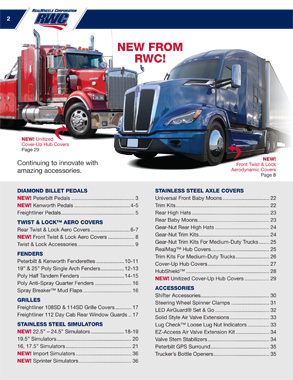 DESCRIPTION MODEL # Semi Truck RWC-1-BO Aero Semi Truck RWC-2-BO Fire Truck RWC-3-BO Call 1-800-982-1180 for more information. 3940 Tannahill Drive • Gurnee, IL 60031 847-662-7722 • Fax: 847-662-7744 • www.RealWheels.com © 2017 RealWheels Corporation. All Rights Reserved.